Golden Boys and Me: Taking a Moment with Pepperidge Farm® Milano® Cookies & $100 Visa Gift Card Giveaway! 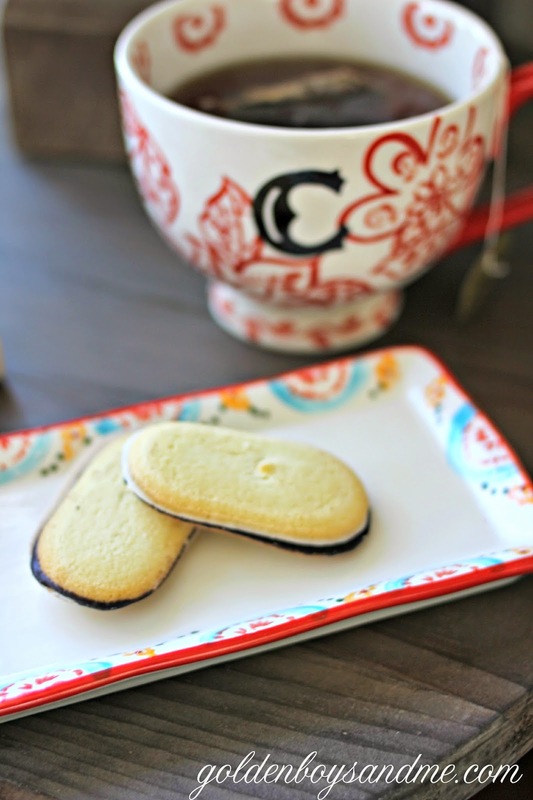 Taking a Moment with Pepperidge Farm® Milano® Cookies & $100 Visa Gift Card Giveaway! I am all about the simple little pleasures in life that make a huge difference in my day. As the mom of 3 growing boys, and wife to a police officer husband whose work schedule changes from day to day, I have learned to carve out a few minutes to myself during the day to re-charge. Because life sometimes gets overwhelming. And we deserve a break, right? Simple things like fresh flowers, a good book and a sweet treat can go a long way in reducing stress. Taking a little break just makes the whole day better. My most sacred "me time" is just before elementary school pick-up, around 2:30pm. Throughout the day, I have been busy working on this blog and taking care of all the many things that are necessary to keep our home up and running. I am sure all moms can relate! We juggle so many different roles every day, but often don't feel like we're doing all of them really well. Sometimes it's important to take a moment to focus ourselves and to pause from our everyday busyness to savor the present. 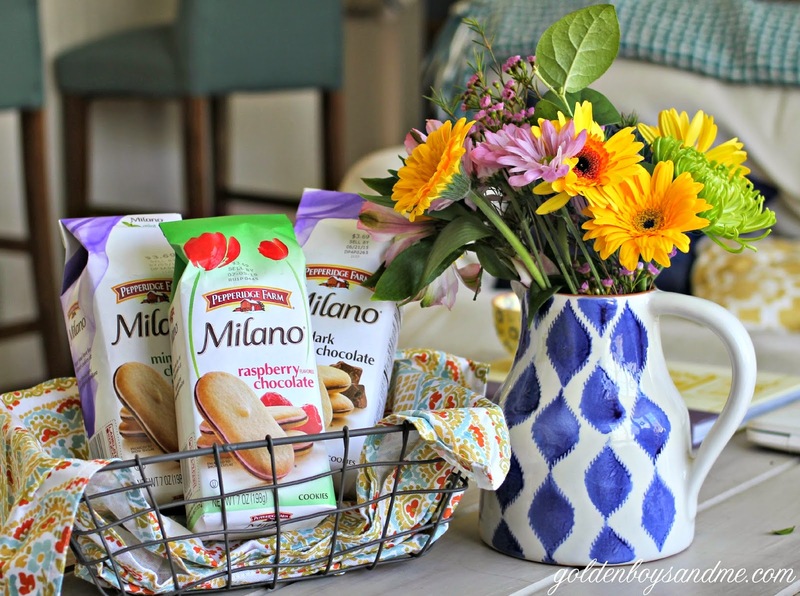 I like to take a few moments to enjoy my afternoon tea and treat myself to a couple of Pepperidge Farm® Milano® Cookies (the Mint Milano cookies have been a long time favorite of mine!). I gather my thoughts, maybe read a chapter in a book, and mostly just savor the quiet. Because the busiest part of my day is about to happen! With school age kids, it seems the most important (and craziest) parenting hours are those from when school gets out until bedtime. I want to be fully present with my kids as we get homework done, take care of the many after school activities, and finally cook dinner and eat together. It is a lot to get done in a short amount of time. But before all that happens, if I take a few moments for myself, I am ready to face the rest of my day head on. When my kids were younger, I always savored their nap time as my time. Now that they are in school all day, I find that I need to consciously stop myself from all of the running around and take some time to re-group. It makes all the difference. What is your favorite way to take a moment for yourself? Tell me in the comments to enter for a chance to win a $100 Visa gift card. My favorite special moments are first thing in the morning. After the dogs have gone outside. That's my time to have my first cup of coffee of the day. (always the BEST cup!) I've been known to eat half a bag of Milano cookies on my way home from the grocery store. They are dangerous. 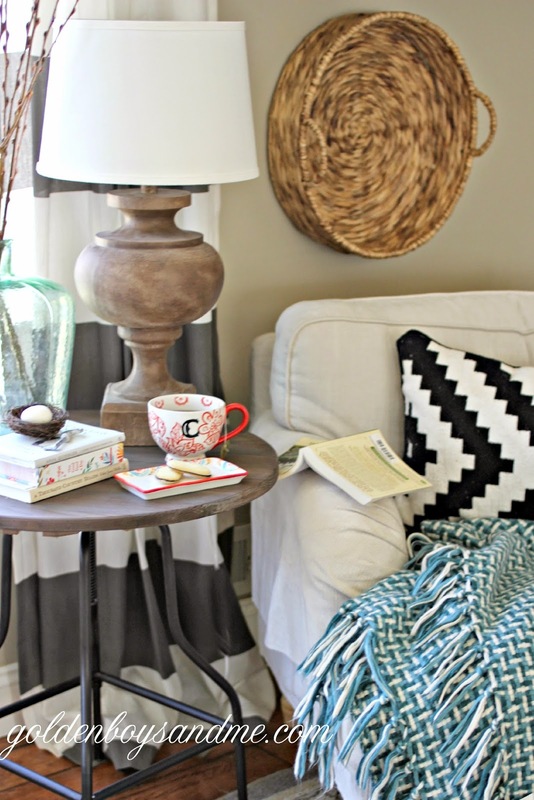 Courtney, I just started reading your blog this year and Love, Love, Love your home. So warm and welcoming! I just read today's post while starting my day with a cup of coffee and wanted to tell you that I too am a wife to a police officer (now retired). I have a graduating senior this year and am crazy busy. (there is so much to do) I also found that I own two of the cups that are on the table! Now if I can just find that pitcher! So yeah, this is my time to catch up with blogs and such before starting my day at work. Love the cookies. They are my faves too. Love your little spot to sit and relax before the heavy part of your day begins after school. Have a great start to the new week ahead. WOW- great giveaway! My favorite moment - quite coffee time before anyone else wakes. When my daughter was young, getting up a little earlier than anyone else gave me some quiet time before we started the day. Even now, as empty nesters, I still like my quiet time in the morning before our day starts. A hot cup of tea, reading a few chapters in a book or catching up with blogs is the perfect start to the day! I like to take a moment for myself by going on a nature walk or by enjoying a cup of coffee. My favorite way to make me time is make healthy smoothies, and spending time doing my yoga and meditation. It really helps me stay focused! 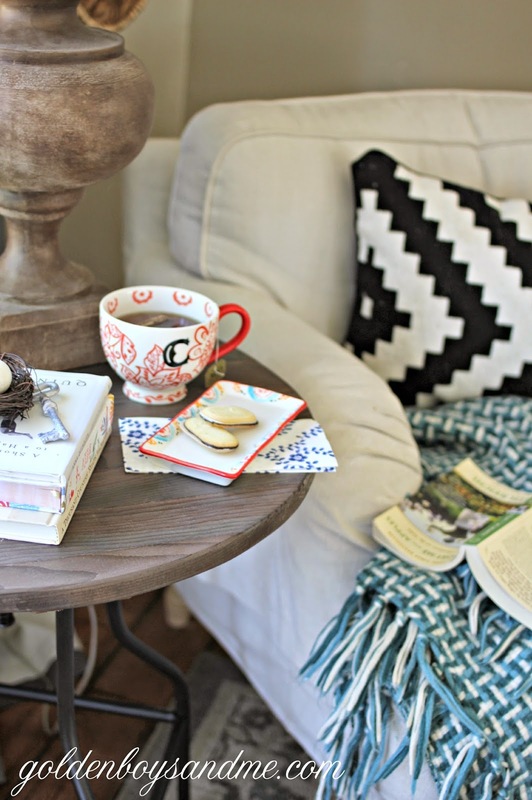 I love to have a cup of tea, some cookies & curl up with a good book! When I have the house to myself and can curl up on the couch with something to read, a cool drink and a little snack (either ice cream or I do like those Milanos). My favorite way to take a moment for myself is to sit out on the patio with a good book and a nice glass of wine. I know this will sound strange, but my favorite "me" time is the thirty minutes it takes to drive home after work. I just bought a new car and it has satellite radio so I can listen to my favorite music (instead of listening to whatever my son flips to when he's in the car), and I've starting taking a new, quieter route home that's mostly through countryside instead of town. It's my down time because as soon as I get home I know I'll get met with "what's for dinner?" and the evening's activities. My getaway is to go and have a mani/pedi done. My favorite way to take a moment for myself is listening to podcast with a cup of tea. I like to bake when I need to take a moment for myself. I love listening to some good music and having a cocktail. My favorite way to take a moment to myself is to sit down & relax with a cup of coffee in the afternoon! I like to relax in my garden in the morning with a book. A favorite way to take a moment for myself is relaxing out on my hammock on a nice day with a good book. I like to close my bedroom door, turn on Turner Classic Movies and just relax. If a Bette Davis movie is on its even better. I love a nice cup or glass of tea, something delicious and a nice book! I love to go out running. It helps me clear my mind and I like getting lost in the music. Taking a moment for myself - I like to visit and have coffee with a good friend. I like a few quiet moments to read the newspaper over a cup of coffee. I like to take a moment for myself with a good book and a glass of wine, or a cup of hot cocoa. I unwind by reading in bed in the evenings. I love to lay around watching movies or TV with my favorite snack. My favorite way to take a moment for myself is with a long hot shower. I like to sit in my backyard with a cool drink. My favorite way to take a moment for myself is to just relax in a quiet space with some nice tea. I like to take a moment for myself and go online with a cup of coffee. I spend my "me" time by reading a good book -- a piece of classic literature is best! I like having a coffee and a cookie on my porch swing. I like to read a book and have coffee. I like to sit in the sun with a good book! I like to take time for myself with my favorite music and a great treat. I enjoy an intriguing read. I like to read in bed while the baby is taking a nap. I love to take a moment, sit back and have a caramel latte. My favorite way to take time for myself is to soak in the tub and read for a while. thank you! My favorite way to take time for myself is with a cup of coffee sitting out on our patio enjoying the birds in the mornings. I love to grab the sunday crossword puzzle and a cup of coffee (or wine, depending on the time of day). I relax and do a crossword puzzle. My favorite way to take some time for myself is to take a long walk in nice weather. My favorite is a hot bath, a good book, and a glass of sweet iced tea. I love to just veg out watching nature documentaries on Netflix! I take a moment for myself when I go cycling solo. I take a moment for myself to relax and breathe. My favorite way to take a moment to myself is by sewing. I like the way it relaxes me and frees my mind at the same time. I like to create time for myself by relaxing on my sunny porch with a good book or some magazines, a hot beverage (tea) & some Milano cookies! I like to read and enjoy a good cup of tea!